Why Go RVing With Your Motorcycle? RVs and motorcycles, what an adventurous pairing! Obviously, we here at RV Life have an inherent need for freedom, open roads, and open skies. We seek a lifestyle that allows us to pick up and go on incredible trips. Whether across the state or country for weekend getaways or yearlong road trips, we just want to go. We want to connect with nature, see incredible sights, and maybe grab an awesome bite to eat along the way. To be honest, this sounds eerily similar to what every motorcyclist wants. While a connection is not immediately made between RVing and motorcycling, the patrons who enjoy each have an awful lot in common. There is even an entire class of RVs dedicated to letting you extend your adventures. Cue the toy haulers. With an entire garage at the back of your rig, there is no excuse to not bring your two-wheeled companion. Even if you don’t have a toy hauler, you can easily get your motorcycle strapped to the back of your RV on a trailer or hitch-mounted carrier. 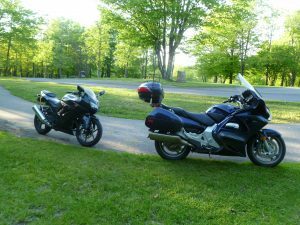 Two motorcycles parked at the campground. There are many perks to bringing your motorcycle on a trip. The most notable is being able to explore places and roads that you might not be able to pull your RV down. As lightweight and rugged as some trailers are getting these days, most of us don’t own an “overland” truck and trailer combo. 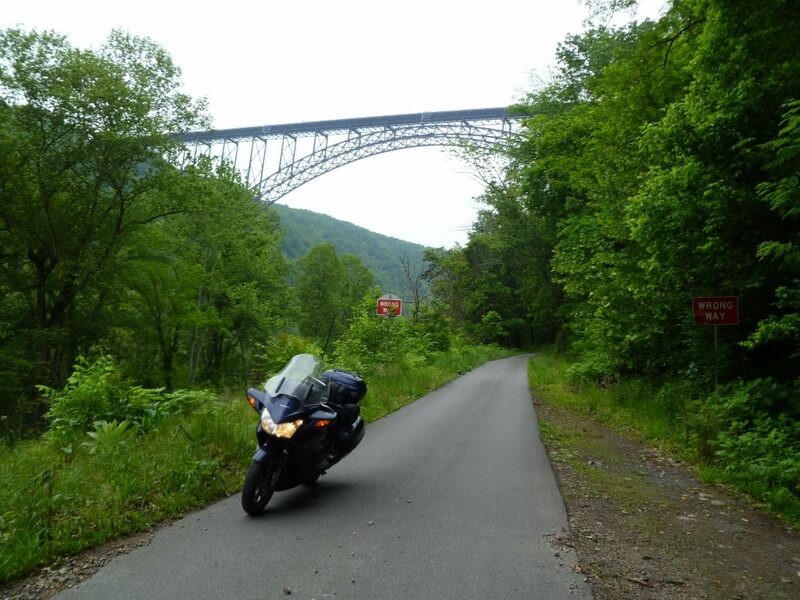 Motorcycles let us see roads that our RVs impede us from accessing. Adding a cherry on top, the most beautiful motorcycle roads often surround some of the best camping locations in the country. If you have a dual sport or adventure motorcycle, your options are almost limitless. Using an RV is already a great way to travel and see the country. If you add a motorcycle, there is a little bit more at your fingertips. You can pick a beautiful destination to set up camp and park your rig. Then, take off on your bike to ride all the backcountry roads. Once you’ve worn yourself out shifting gears all day, you can meander back to your campsite. Your RV will feel like coming home with a warm shower, a comfortable bed, and some home-cooked food. Then you can sit back around a fire and talk with your riding partner about all the incredible things you got to see that day. Go to bed, get a good night’s rest, and wake up to do it all again the next day. I would call that living the dream. Whether you ride motorcycles or dirt bikes, getting to see more of the world on two wheels is never a bad thing. So strap that glorious machine down to your RV and hit the road! Whether it’s my big rig or my baby camper, my trusty Yamaha WR250R comes with me. Among the other advantages mentioned, destinations normally off limits during the summer rush become a practical option. We recently visited Yellowstone and Glacier during July and never had a problem parking and the traffic was much easier on a bike. The visibility on a bike is unmatched. Agreed, The only real limitation is weather and wearables. Toy haulers aside, towing a bike like the 300cc scooter shown is a breeze in a Class A or any other class I imagine. You do have to keep looking to make sure it’s still there. Backing up a small trailer in a Class A can be intimidating until you learn to use your mirrors and the backup camera..
Just purchased a Kendon trailer and will be taking our Yamaha FJR1300 with us this summer up to Colorado, pulled by our Jayco Greyhawk. Should be fun. I installed a hitch on the front of our motorhome, it makes life so much easier when backing in a tight spot. The ZERO brand electric motorcycle is idfeal for this. No oil or gas or maintenance, stays clean. Charges overnight from a regular 120 volt plug-in at campground without using any more power than your air conditioner. Range of 100 miles. We have used this for 5 years now. Been riding and camping for over 25 years….just got back last week….the only way to fly! Till you run into a campground that does not allow motorcycles. I was just looking for a place to camp around Pymatuning Reservoir. Found a place that looked reasonable on the lake. Just happened to read the rules and noticed NO MOTORCYCLES allowed. That is the second time I’ve run into that. Maybe this site could begin a list of Campgrounds and +- features like allowing motorcycles. Having said that, some campgrounds ban M/C for a reason that has to with abusers and things like noise. All very good reasons. I was to a campground last year in PEI that had a sign banning M/C, but on talking to the manager, he agreed to allow us in with certain provisos. Turns out he had issues with noisy bike gangs/groups in the past that disturbed the peace. Once he understood our bike was V/quiet and our only other mode of transport he relented, asking only we keep things quiet, which is my preference. It pays to call first.